Figure 7.1 Hide everything except the Hicks model mesh using the Display panel. (see Figure 7.2). Finally, to prevent the Hicks model from being affected while you're adjusting the biped, freeze him in place by choosing Freeze Selected in the Freeze section of the Display panel rollout. 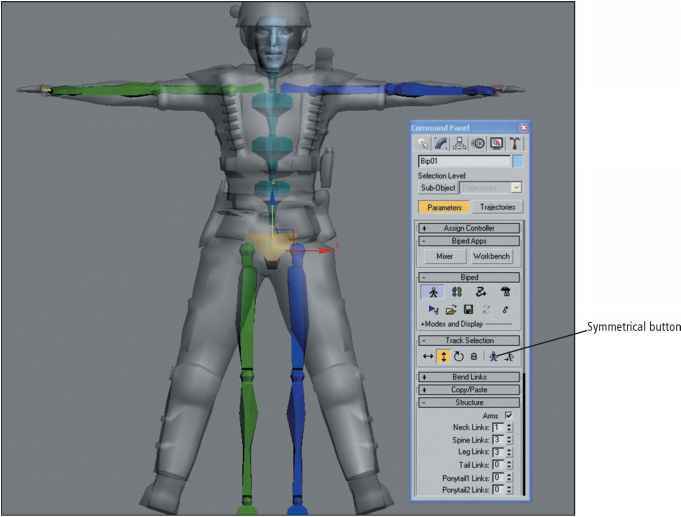 Follow these steps to install and position a biped structure that will be used by the animations in the Torque engine to move the Hicks model mesh. Figure 7.2 Make the Hicks model transparent using the See-Through option; then freeze him. 1. Click on the Create panel, and then click the Systems button. Under the Systems section, click the Biped button. A default parameterized panel rolls out, allowing you to make adjustments to the number of limbs, fingers, toes, and so on that your character will have. For now, leave that section alone, because you can adjust those settings after you create the biped. In the User view, click and drag the cursor to the approximate height of the Hicks model, and release it. In a flash, the new biped skeleton is created (see Figure 7.3). 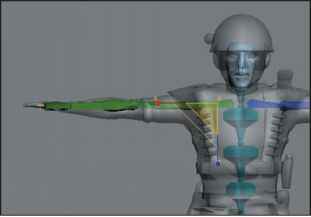 Figure 7.4 Adjust the parameters of the biped to change the bone structure. 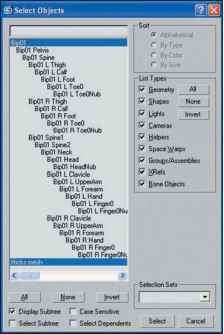 Figure 7.3 Select Biped from the Object Type section of the Create panel, and click and drag to create a biped. 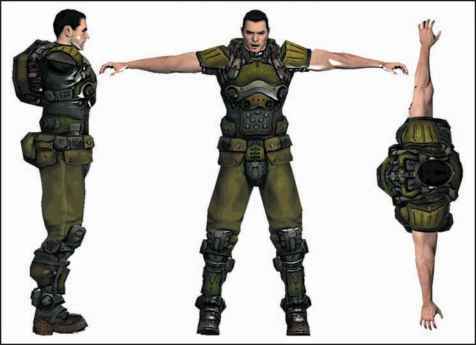 though the Hicks model has five fingers, and you could just as well install all five, his hand will be the only thing animating that portion of the general appendage, according to the default animations of the Torque engine. (For other game engines, you might need to utilize these finger bones to articulate the fingers in the mesh.) Finally, change the Height parameter to 1.78m; this will be the approximate height of the Hicks model. You can change the parameters in the Biped rollout to create a nearly infinite amount of skeletal structures that would fit and work with almost any shape mesh. The possible bipedal arrangement has a couple of interesting features. For instance, you can use the Ponytail links to drive the lower jaw of a character, which you can then animate to simulate speech. Figure 7.5 Enable the Figure Mode button in the Motion panel. 3. Now you must move the biped and rotate it into position. 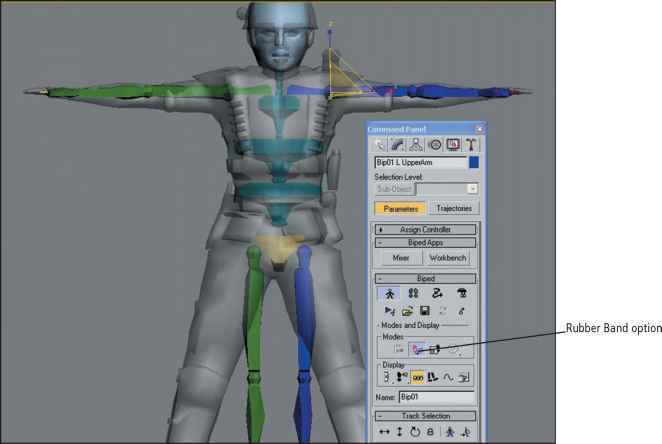 The goal here is to place the biped in the exact center of the Hicks model mesh; then you can adjust the individual limbs to coincide with the Hicks model's joints. To do this, click on the Motion panel, and then click on the Figure Mode button (see Figure 7.5). The Figure Mode button allows you to fine-tune the biped's shape to match the Hicks model's. The Motion panel is also where you can make and modify animations for the biped. 4. Use the Select and Move tool, along with the Left, Top, and User views, to position the biped so that the pelvis is in the approximate location of the Hicks model's pelvis (see Figure 7.6). 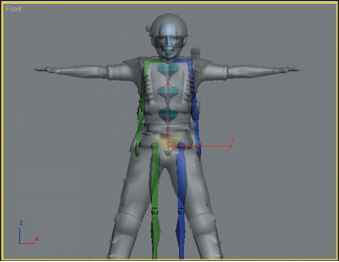 The pelvic area houses the biped's center of mass (COM), which helps determine the overall balance that the character possesses when in motion. Be sure to align the biped so that it is as centered as possible within the mesh. 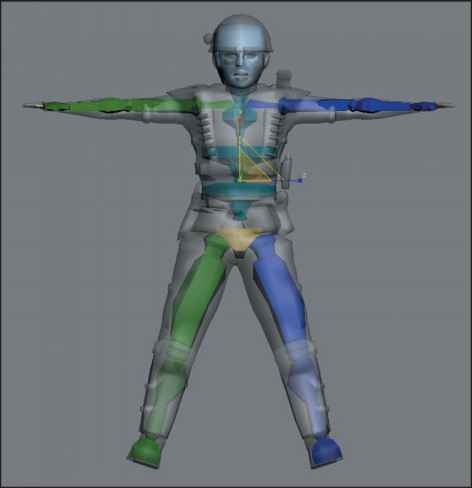 Figure 7.6 Rotate and move the Bip01 object so that the biped pelvis is centered to match Hicks' pelvis. The COM is a separate element of the biped structure, and not really a bone object. You can position it during animations to change the way a character moves. For instance, when a character transitions from a walk to a sprint, it would be more natural for the COM to shift forward, causing the character to lean forward. If the COM stayed exactly in the center of the pelvis, the character would remain unnaturally erect when going from walking to sprinting. Now for the fun part (note sarcasm). This next part, where you have to scale, transform, and align all the bones of the biped so that they take on roughly the same shape as the character mesh, is probably one of the most time-consuming and tedious of things to do in the modeling industry. The point of this careful aligning is to make the skin-weighting job (discussed in the next section) much easier. 3ds Max does a fantastic job of making biped alignment a fairly smooth process, but let me warn you now—you must take your time and have patience. This process will become easier with experience. 1. Switch to a Front view (this displays the front of the model) and click the Min/Max toggle button at the bottom-right corner of the screen. This makes your character take up the entire screen space. 2. Start by swinging the biped's arms up so that they generally match the Hicks model's. Do this by clicking once on the Select and Rotate tool, and then once on the left upper arm, which should become highlighted. Next, click on the Symmetrical button in the Motion panel; the right upper arm of the biped becomes selected. It's best to work symmetrically; that way, everything stays even. Now click and drag on the first yellow concentric circle of the Rotate gizmo, which represents the Z-axis of the bone. As you drag, notice that both arms swing upward (see Figure 7.7). You might have to turn off the Angle Snap Toggle button to position the arms more precisely. The arms should now be somewhat in the same position and shape as the Hicks model's. Figure 7.7 With the Symmetrical button enabled, rotate the upper arms so that both are in the same position as the Hicks model's. The biped object's bone structure works in almost the same way that a human's does. That is, if you try to rotate the forearm back and forth, it only goes toward the body and does not bend backward at the elbow. Also, as you pull forward on the forearm, the upper arm naturally (and not rigidly) follows with it. This process is called inverse kinematics. It is a characteristic feature of Character Studio bipeds. 3. Now you need to scale the upper bones of the biped to match the Hicks model's mesh. First click on the Select and Non-Uniform scale button, and then click on one of the clavicle bones. After that, select the Symmetrical button in the Motion panel and scale the bones so that they spread the arms away from the body a bit. This action pushes the upper arm bones out so that they're in better position (see Figure 7.8). 4. Continue scaling the other spine, neck, and head components to fit the mesh. The spine doesn't need to precisely fit the belly of the Hicks model; simply adjust the spine so that the arms drop down and center themselves within the mesh. You can scale the head fairly big and elongated to cover the entire neck and face of the Hicks model. 5. Next, you can stretch the arms and scale them outward. A cool feature of biped is the Rubber Band option, located in the Motion panel. Click on this option; then select the forearms and scale them. Notice that as you scale the forearms toward the palms, the upper arm bones follow in a stretching attitude (see Figure 7.9). You can use the Rubber Band feature only with the arm and leg bones, but it does make your job much easier. Symmetrically scale the clavicles so that they spread the arms away from the body. Figure 7.9 Enable the Rubber Band option and symmetrically scale the forearms to match the Hicks model's. If you're having trouble conceptualizing the rotation of bones, or if you try to rotate one bone and, annoyingly, another bone moves, mimic the same movements yourself. Just place your arms straight out, palms down, and rotate your forearms backward. Your hands have no choice (unless you're weirdly jointed) but to rotate backward, too. 6. 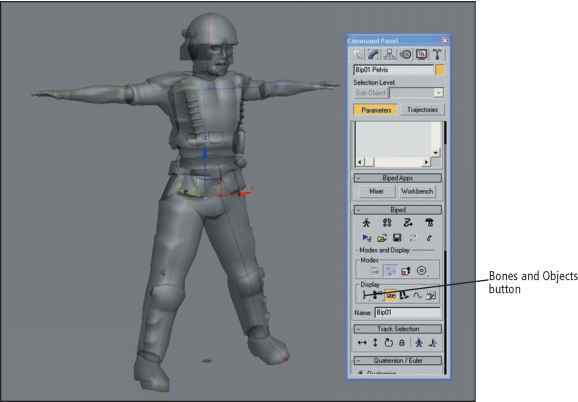 Continue scaling and adjusting the biped's upper arms, forearms, and hands to completely fill the Hicks model. Be sure that the joints generally match up to the joints of the Hicks model mesh. That is, the elbow is where the upper arm and the forearm meet, and the end of the forearm is the wrist, just after the Hicks model's metal cuff. Then switch to the Top viewport and align the arms in this view also. 7. Repeat steps 2 through 6 for the legs (see Figure 7.10). Figure 7.10 Repeat the moving, rotating, and scaling procedure for the legs. Be sure that the joints match up. 8. When the bones are scaled and they match the Hicks model as well as possible, click the Min/Max toggle button to go back to the orthogonal view screens. Select and maximize the Left viewport, and spend some time scaling and aligning the biped from this view. Scale and move all the bones so that the entire biped structure fits as well as possible into the Hicks model mesh (see Figure 7.11). Note that the spine objects don't have to be big; in fact, scaling them to the size of the mesh only makes the weighting envelopes enormous and causes them to hog all the vertices of the Hicks model. Figure 7.11 Use the other orthogonal views to scale and rotate all the components to match the side profile of the Hicks model's body. Note that you don't have to scale the spine objects to match the Hicks model's body. clicking the Save button again. It now saves the biped object (that is, the bones structure that you created). Saving these items (FIG and BIP files) is a good idea so that you can recall them later if you accidentally move any of the bones. Saving them also allows you to retrieve the biped for another character (see Figure 7.12). Figure 7.12 Save the biped figure using the Save Biped File button in the Motion panel. Figure 7.13). The small + signs between bones represent the joints, giving you a better view of their alignment with the mesh. Hmm, doesn't look like all that work you put in was worth it now, eh? Figure 7.13 In the Display section of the Motion panel, turn on Bones and turn off Objects. Before you continue, you need to combine all the various body parts into a single skin mesh. Because the skeleton is a single system, the skin also needs to be a single object. To combine all the objects, select a single part such as the torso, click on the Attach List button in the Modify panel, and select all the other body parts. This combines all the parts into a single skin mesh object. You can tell when you're successful because all the parts will have the same object color. You need to unfreeze the Hicks model and unhide any object that you hid earlier in the chapter. Go to the Display panel and choose both Unhide All and Unfreeze All. The Torque engine uses the Bip01 object as the top level of the hierarchy. All that should be in the scene now are the Bip01 biped structure and the Hicks mesh (see Figure 7.14). object, Footsteps, all toes, any fingers, and nub objects. Figure 7.14 In the Select Objects dialog box, only the Bip01 structure and the Hicks mesh exist. Figure 7.15 Apply the Skin modifier to the Hicks model mesh. Expand the modifier, select Envelopes, and then add all biped objects (except Bip01, Footsteps, toes, any fingers, and nubs) to the Envelopes section. the original biped object, to curl the fingers of the Hicks model mesh, but the Torque engine's default animations don't use them—the hand bones move both the hands and fingers of the Hicks model. After you've included the proper selection of bones in the Skin modifier, the Hicks model mesh becomes surrounded by wireframe representations of the adjustable skin envelopes (see Figure 7.16). How to link biped to character?